Right to sexual and reproductive health (SRH) is guaranteed in main human rights laws including the International Covenant on Economic, Social and Cultural Rights 1966, the Convention on the Elimination of All Forms of Discrimination against Women 1979 and the Convention on the Rights of the Child 1989. Member states to these treaties are required to provide adequate numbers of (SRH) facilities, services, and goods on an equal basis to all. It is crucial that sufficient medical personnel and essential medicines, including contraceptives be available and accessible to everyone countrywide, and that their dissemination respects the culture of individuals and communities, that they be of good quality as well as scientifically and medically appropriate. Moreover, it is important that services and goods be affordable. Sexual and reproductive health services in Iran are influenced by population policies. Willingness of Iranian policy makers to control the population’s growth rate resulted in the provision of family planning services and contraceptives from 1990 to 2013. After years of successful implementation of the countrywide family planning program, Iran decided to change its population policy and to limit provision of family planning services in order to compensate the statistically significant decline in the fertility rate and ageing of the population. It is essential that government acknowledges potential problems related to aging of Iran’s population. But what should be done about limited access to sexual and reproductive health rights? 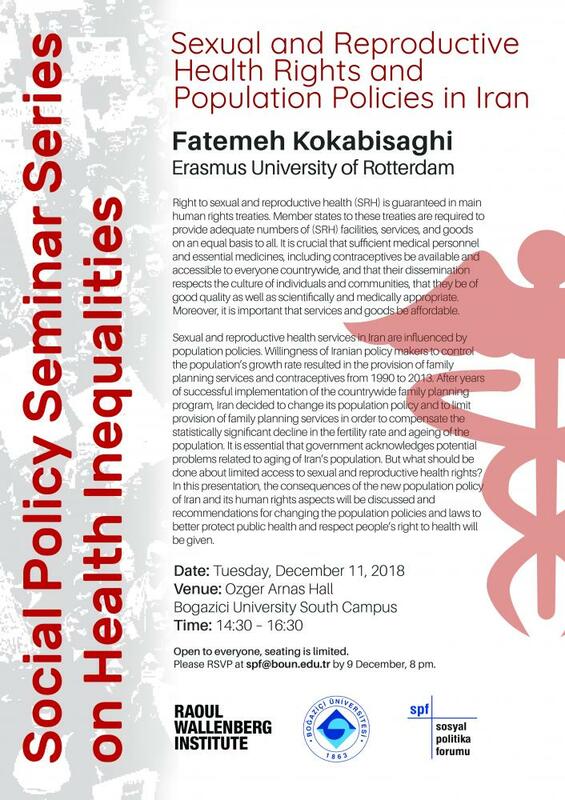 In this presentation, the consequences of the new population policy of Iran and its human rights aspects will be discussed and recommendations for changing the population policies and laws to better protect public health and respect people’s right to health will be given. Fatemeh Kokabisaghi is a research fellow in Erasmus School of Health Policy and Management, Erasmus University Rotterdam, the Netherlands. She is an interdisciplinary scholar working at the interface of Public Health, Human Rights Law and Development Studies. The seminar is open to everyone and seating is limited. Please RSVP at spf@boun.edu.tr by 9 December, 8 pm.